It's all about staying connected in the modern household, and everything from high-speed internet to multi-channel television is now viewed as an essential part of everyday living. With Virgin Media offers, you can get great deals on a wide range of phone, internet and television packages. So whether you've just moved house or you're looking for a better deal on your existing services, check out what you could save with a Virgin Media promotional code. Originating as an ISP way back in 1996, Virgin Media has grown over the years to become one of the country's leading communications providers. With its roots in the early days of home internet, the company has plenty of experience with translating developing technologies into practical solutions we soon come to depend upon in our everyday lives. Focused on using emerging technologies to improve the lives and prospects of everyone, Virgin Media aims to provide reliable and affordable communications services to homes and businesses around the country. These days, Virgin Media has expanded beyond just internet provision and now offers a wide range of mobile, landline, television and internet packages. As the UK's first provider of all four services they're experts in what they do, committed to providing the best support, guidance and services and ensuring that technology remains a force for good throughout our communities. Virgin Media's growing cable network already supplies ultra-fast broadband internet to over half of UK homes, while their home phone service is one of the country's most popular. The company's interactive television service is at the cutting-edge of technology, combining broadcast TV, thousands of hours of TV on demand and the best of the web in a single set top box, while Virgin Mobile was launched over a decade ago as the world's first virtual mobile network. Subscribers can choose from a wide range of packages designed to suit their individual needs, from broadband only to a selection of bundles that add a home phone line, interactive TV or a mobile SIM – or a combination of all four – to your monthly package. Prices are competitive, with plenty of incentives like free installation and unlimited calls and texts to make getting connected with Virgin Media an excellent deal for everyone in your household. Want to get an even better deal? With Virgin Media offers you can enjoy fantastic discounts on a range of internet, TV and phone services. 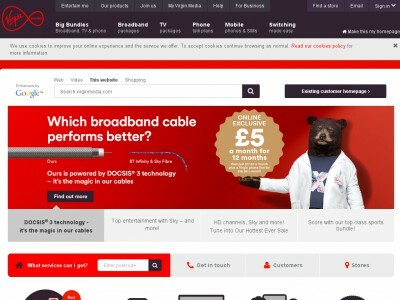 Whether you want a super-fast fibre optic broadband connection for a new home or you're looking to combine your separate mobile, TV and internet providers into one low-cost bundle, a Virgin Media promo code will help you make big savings while you shop. One of the country's most advanced interactive TV services. Browse our website until you find a Virgin Media voucher code that suits you, then navigate to their website to begin shopping. Click on a service for more information then click 'Buy now' to sign up. Enter all your details and click 'Continue'. When applicable, enter your delivery details. Enter your Virgin Media promotional code where applicable. Want to find out more about the amazing products and services offered by Virgin Media? Why not check out the company's dedicated YouTube channel? You'll find lots of exclusive video content including overviews of Virgin Media projects and events, guides to the different services and bundles available, competitions and more. You can also use this channel to find out more about saving money with the latest Virgin Media offers. Need to contact the team at Virgin Media? Whether you have a question about one of their services, want to enquire about what's available in your area or simply want to know how you could save money with the latest Virgin Media offers, you can contact the Customer Services department by accessing the online help centre here. Want to explore behind the scenes at Virgin Media? Why not follow the company across all your favourite social media networks? You'll find plenty of fun and interesting content, including competitions, film and TV news, celebrity gossip and more. You can also use these pages to find out more about saving money with Virgin Media offers. Don’t forget to check them regularly, as you can never be sure when a free Virgin Media promo code might be waiting for you! Buy now online at www.virginmedia.com.